Get Sconed! 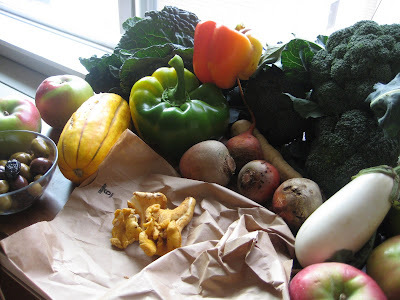 : NOVEMBER FARMER'S MARKET SCORE! Saturday morning I hit up the Portland Downtown Farmer's Market for the first time in a while with my friend Michelle. I was restocking my empty kitchen and she was preparing for her vegan Thanksgiving Potluck, to which I brought my last post's pecan pie. I ridiculously cherish going to farmer's markets as it is, but I knew it was the end of November and had squash and potatoes in mind. It has been a mild fall, and to our delight and wonder, we were able to a wider variety of produce than we expected - including bell peppers and eggplant. We spotted some cherry tomatoes but we're not crazy. - McIntosh apples: 50 cents a poud for my favorites!!!!!!!!!!!!! - broccoli $1.25/lb - sadly, I thought I checked thoroughly but I did have a long battle with my arch nemesis, broccoli bugs, when I got home. warm water, white vinegar, repeat, repeat, repeat, cry, scream, repeat, check, check, check. 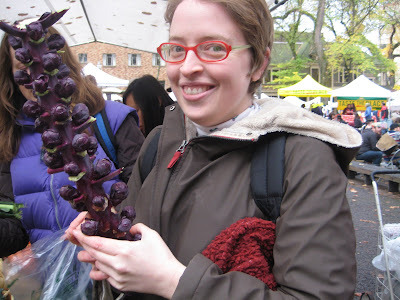 Michelle and I both got excited by these purple brussel sprouts. We're both big studies of local vegetables and had never seen these before and were drawn in. We looked at each other with astonishment and glee! Last stop - The All Mushrooms stand. I couldn't resist buying those 3 chanterelles. Roasted broccoli and the last of my Vegan Brunch test kitchen chorizo. After the farmer's market, Michelle and I stopped by Hot Lips for vegan foccacia slices. The slices had delicata squash, which was adorable and delicious. I also had a bubbly Hot Lips apple soda. 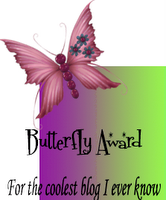 And thanks to Bianca of Vegan Crunk for the Butterfly award note! YAY! Everything looks great. White Eggplant?! Very cool..
You're like a broccoli bug magnet, I think. I've never seen purple brussels either! It's too bad they turn green when they're cooked. Those mushrooms! Oh man...and the marinara looks wonderful! you got so much for $14! that's awesome. those furry mushrooms are crazy looks!!! i love them. they look like opossums for some reason. I love farmers' markets! It's like a scavenger hunt for tasty veggie surprises. ;) Weird-shaped eggplant, purple potatoes, ground cherries, odd little varieties of tomatoes...you never know what beautiful and yummy things you'll find. Hooray for your adventure! Thanks for taking me along--what a great farmer's market you have. Reminds me of GreenMarket at Union Square in NYC. I can't wait to go to the Reading Terminal Market later today. After a week away, we are out of everything. what does one do with lion's mane mushrooms?! they look so cool! Who knew brussel sprouts could be so beautiful! Purple brussels?! 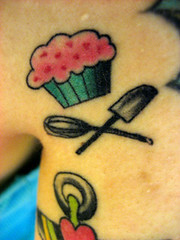 Even if they turn green, I want 'em! I haven't bought them on the stalk yet, is there really a difference? 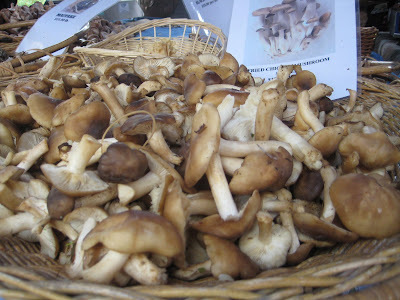 Ooh, I miss Portland's farmer's market SOO much! Nice pictures!